Almost forty years ago, California’s young new governor faced the challenge of leading his state through one of its worst droughts ever. Around that time, a group of cartographers had been hoping to develop a comprehensive and definitive atlas of the state and one of them suggested the idea to an advisor to the governor’s office, Stewart Brand. In light of the crisis, a scaled-back, more focused atlas detailing California’s water systems garnered support from members of the administration and governor Jerry Brown. 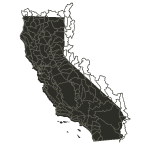 Several years later, in 01979, California’s Office of Planning and Research published the California Water Atlas, an attempt at “providing the average citizen with a single-volume point of access to understanding how water works in the State of California,” as the volume’s foreword, written by Project Director and Editor William L. Karhl, put it. Several decades later, California is once again governed by Jerry Brown. 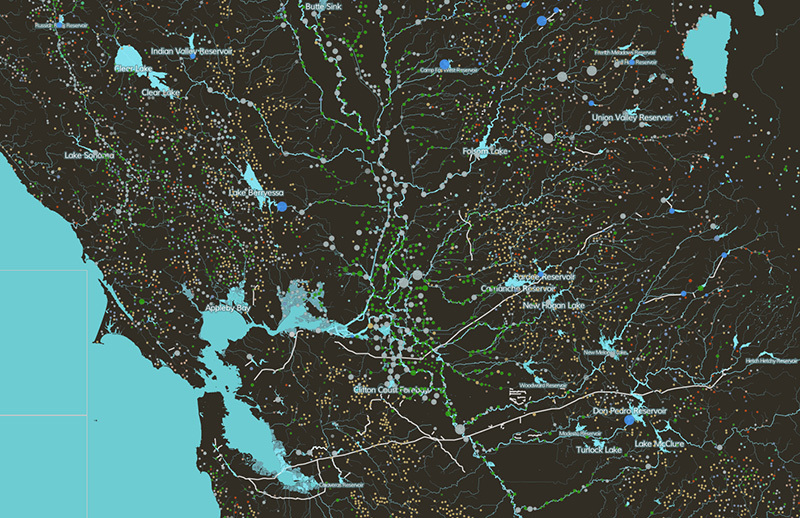 Drought has returned and so, coincidentally, has the water atlas. The New California Water Atlas seeks to revive and update the original’s citizen-serving, data-sharing approach by offering online, interactive maps. 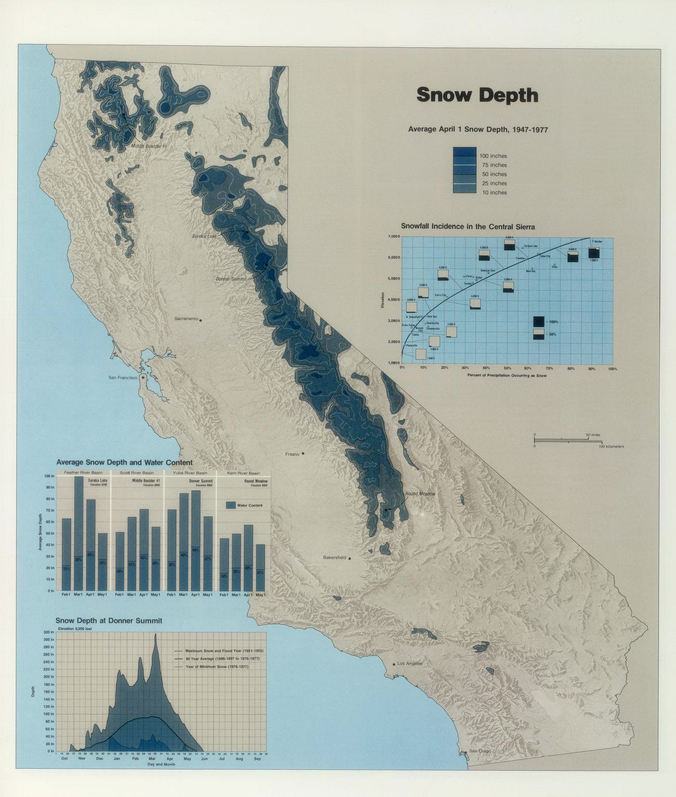 Headed up by Laci Videmsky, a project director at the Resource Renewal Institute, The New California Water Atlas operates as a non-profit project, rather than directly out of the Governor’s office. Now moved to the web, it also seeks to publish not a single volume, but a growing body of tools and interactive visualizations with regularly updated data. Videmsky spoke with me about the project from Berkeley, where he also lectures for the College of Environmental Design at the University of California. He described at length how the original Water Atlas inspired this new project and about what’s in store. Videmsky first encountered the original Atlas when his wife brought it home from UC Berkeley’s library. “Both of us were in awe,” he says. I was really interested in the ethos of open government and how people were using data, thinking about transparency and accountability, and how their systems communicate with government and the kinds of technologies they were using to connect people. And most of this work was being done at the city level and then at the federal level and also most of it was related to various amenities and services that were often not natural resources, so I wondered, why don’t we take this open government and open data to natural resources agencies? They are civic institutions and they could benefit from this. One area he began researching was California’s system of granting water rights. I was learning how to do web mapping and I called the state water board to download their data from their site. They had kind of an older application that they’d built a while back that kind of half works and doesn’t have an easy way to search or to download data, and they were actually nice enough to just give me their whole data set. Not long after these extracurricular efforts, he walked into the office of Huey Johnson, founder and president of the Resource Renewal Institute (and a former SALT speaker), and noticed a copy of the Water Atlas. Johnson had been the Secretary for Resources in Jerry Brown’s first administration and served on the Water Atlas’s advisory board along with Stewart Brand. They got to talking about the original Atlas, as well as some of Videmky’s efforts to visualize water data. I showed him this interactive map that I’d made with the water board data and the lightbulb went off and we started having conversations about open government and how open data’s kind of changing the way government works and how we can maybe do that for California water. We’re working on groundwater – so another state agency called the Department of Water Resources, which actually funded the first atlas, they have a data set of all the water levels in the ground of about 15,000 groundwater elevation monitoring wells. We downloaded from their water elevation monitoring system about 500,000 records which represents about 30 years of data for the whole state. It was very laborious – it took us a month to get 30 years. Using the final product, Californians will be able to zoom into an area of the state on a map and move a slider to view the last 30 years of fluctuations in groundwater levels. I’m starting a collaboration with the California Public Utilities Commission to make data available to visualize water prices. Water isn’t priced according to scarcity, it’s priced according to the price of delivering the water. So I think it’d be really, really interesting for people to be able to compare what they paid for water. Some of it was easier than expected. The state government probably has more information on water than any other subject, but early fears that the information would be jealously guarded by the agencies turned out to be incorrect. At every level, from local to state to federal, people were generous with their data and their time. A lot of state agencies don’t have the resources either in staff or money to improve the way they make water understandable and water data available to the public. And so there’s definitely a need for private-public partnerships and that’s actually happening in many different sectors. We get a lot of moral support from the agencies. They’re very excited about this. We’re making something that’s very visible, highly accessible and so they’re really eager to participate. Beyond helping the state’s agencies tell their stories, Videmsky is also exploring the idea of making a platform for citizens to tell theirs as well. One idea – this is not implemented – but one idea is to allow for, almost a site within a site so a user would be able to create a blog around a certain geographic area. They’re dealing with issues locally that are important to them, like groundwater contamination, so it’d almost be like a citizen atlas, where citizens’ science sits alongside authoritative data. There are a lot of stories to tell that are not necessarily data stories but personal stories. Additionally, they’re looking for help from programmers, translators (they want the site to be in both English and Spanish), designers and data-wranglers. Much of their work is open-sourced on GitHub, where they’d be happy for help building part of the visualizations or cleaning up the data. Keeping the project open-source isn’t just a collaborative choice, though. Videmsky sees it as a way to help the project bear long-term fruit. While the original Atlas was a single volume, the web will allow the new Atlas to live and grow along with the state and possibly to be adopted by other states or for analyzing other natural resources. Along other long-term lines, Videmsky said they’re looking for a good institutional partner to help support and archive the data so that the database of California’s water system they hope to build can continue to grow and inform the state’s citizens for generations to come. We are programmed to be interrupted.